Introducing the first mass public transportation system in Pakistan. Photo by Star240. Today we celebrate a positive development coming out of Pakistan, overlooked by mainstream news: an advanced bus system in Lahore, Pakistan’s second largest city. In years past, Lahore, capital of Pakistan’s eastern province of Punjab, was a city where urban public transportation was virtually unknown. For the more than 11 million residents and commuters of the Lahore urban area, the only transportation options were motorized rickshaws, private buses, minibuses, or taxis. 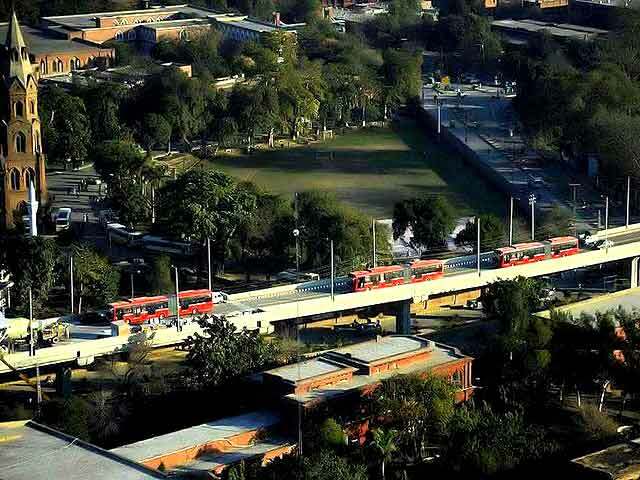 On February 11, 2013, Lahore began operating Pakistan’s first Bus Rapid Transit or BRT system, officially known in the city as the Metro Bus System (MBS). A catalyst in the development of urban transport in Pakistan, as well as in South Asia, the new Lahore Metro Bus System continues the deployment of advanced bus systems in South Asia, first pioneered in cities like Jakarta, Indonesia and Bangkok, Thailand. The advanced bus system in Lahore exemplifies how knowledge sharing positively impacts urban transport. Prior to the installation of Lahore Metro Bus System, the densely populated metropolitan area of Lahore, growing in population at a rate of 3% per year, was without a solid public transport option. In the last decade and in the same region of the world, less than 600 miles away, the city of Ahmedabad, India, was already at work on establishing their own sustainable transport system. The implementation of the Ahmedabad Bus Rapid Transit System (BRT) in 2009 would then further accelerate the spread of advanced bus systems in Asia. What are the benefits of bus rapid transit? Unlike traditional bus corridors in Delhi, Pune, and Jaipur, Ahmedabad gave its residents India’s first full BRT system, which incorporates an integrated approach to roads, stations, buses, technology and branding. As sophisticated bus systems which operate in dedicated lanes on city streets, BRT has revolutionized the urban transportation world. BRT systems have many of the benefits of metro or light-rail systems, with significantly lower construction costs. In India, the BRT is now being replicated in the cities of Surat, Indore, and Bangalore. Opponents to the Lahore Metro Bus System originally estimated the cost of construction at RS 70-80 billion (US$ 713-815 million) and used this figure to criticize the plan to build an advanced bus system. About a year after construction began, the system has launched, and the economic reality of Lahore’s bus system is much different than what naysayers projected. The Chief Minister for the Punjab Region, Shahbaz Sharif, announced at the opening ceremony of MBS that the actual system cost of came to RS 29.8 billion (US$ 303.6 million), significantly lower than original estimates. Launched on February 11, 2013, the bus system spans a 27 kilometer-long corridor linking the suburbs of Gajju Matah and Shahdra to the main city center of Lahore. A fleet of 45 articulated buses (each 18 meters long) transport up to 12,000 passengers per hour, from 27 stations on the route. With the first month of ride fare waived as a promotion, citizens lined the corridor on the opening day, in an atmosphere of celebration and fanfare. Dignitaries and officials from Metro Bus System boarded for an inaugural ride, accompanied by their counterparts and collaborators from Turkey. Tasked with overseeing this project from March 2011, the Punjab Traffic Engineering and Planning Agency turned to a world leader in the development of sustainable transport for guidance, modeling their system after the Istanbul Bus Rapid Transit System (BRTS). Lahore’s MBS planners found a recognized private partner with similar experience in the Turkish al-Buraq Company. The partnership inspired investment from the Turkish firm, Platform, which has been contracted to operate the MBS in Lahore. Through its partnership with Turkey, Lahore has demonstrated the type of peer-to-peer collaboration advocated by EMBARQ and other groups. At the MBS inaugural ceremony, Turkish deputy prime minister Bekir Bozdag expressed interest in building a stronger business relationship with Pakistan and collaborating on additional MBS corridors in Pakistan. This type of international, peer-to-peer collaboration promises not only immediate benefits for cities developing sustainable transportation solutions but establishes long-term economic partnerships that facilitate best-practice sharing, and inspire the spread of advanced bus systems to other cities and countries. Lahore’s implementation of — not only the first mass public transportation system in Pakistan, but a bus rapid transit system — signal exciting possibilities for the development of additional bus systems in Asia. Other countries in the region considering advanced bus systems are Sri Lanka (in the city of Colombo), Bangladesh (Dhaka) and Nepal (Kathmandu). As the Lahore-Istanbul relationship demonstrates, cities in the planning and pre-planning stages, such as Colombo, Dhaka and Kathmandu, should not have to “reinvent the wheel” when it comes to the implementation of advanced bus systems; rather, they should take up where their peers have left off and further research their project for the benefit of their local context and for next generations of advanced bus systems around the world. Opportunities to share knowledge are increasing, through organizations like Asia BRTS. On the website, visitors can monitor regional developments and best-practice sharing and find more information and additional, region-specific resources for reference. Asian localities interested in the planning and construction of the Lahore MBS can find an in-depth presentation from Dr. Nasir Javed (the Urban Unit, Lahore) and additional resources from the organizers and partners of the Asia BRTS conference, such as the Center for Environmental Planning and Technology University (CEPT, in Ahmedabad), EMBARQ, and the Indian Ministry of Urban Development. Dario Hidalgo, Amit Bhatt, Benoit Colin, and Elise Zevitz also contributed to this piece.